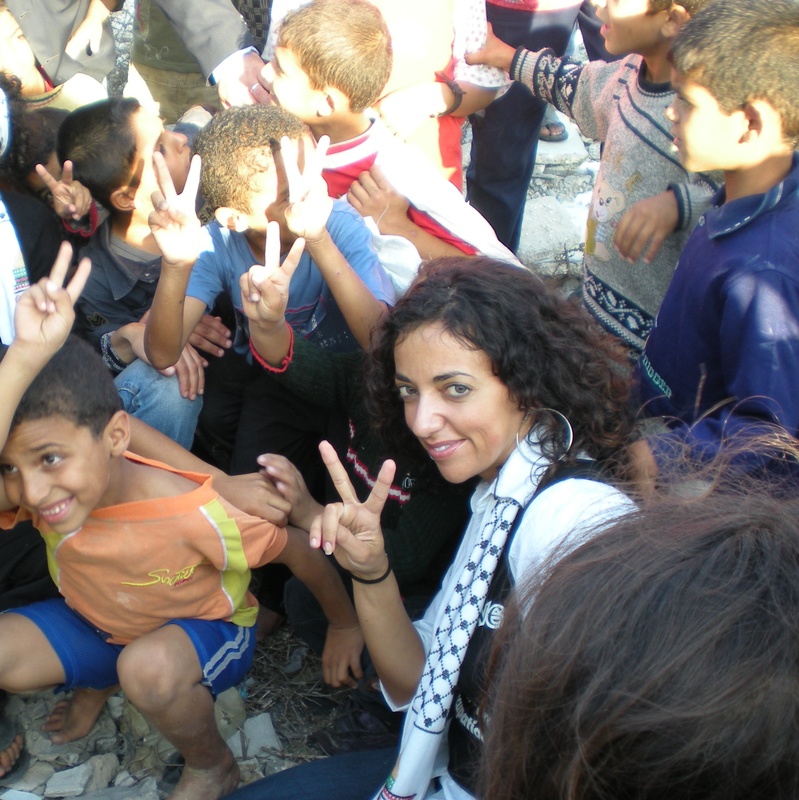 Huwaida Arraf is a Palestinian-American Lawyer and co-founder of the International Solidarity Movement. 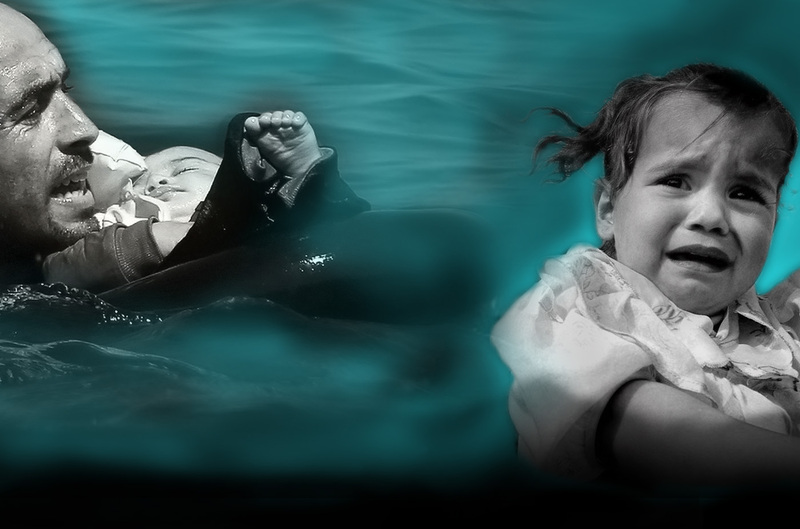 She was aboard the 2008 Free Gaza boats and the 2010 Flotilla that was raided by Israeli Commandos. In 2011, she was one of the six Palestinian Freedom Riders who, inspired by the U.S. Civil Rights Movement’s Freedom Rides of the 1960s, attempted to ride segregated Israeli settler public transport and as a result was arrested. When did you start to be interested in Politics? My parents very much held on to Palestinian Arab traditions and culture while raising us in the US. They were very strict on us but not very political, they were afraid for us in that way. They used to take us back to Palestine every one or two years to maintain a connection with our land up until a certain point, until I was really old enough to realise the discrimination we faced at the airport, the fact that we were separated and strip searched. At one point my father stopped going back to Palestine with the family. When I became a high school student and I could travel by myself I did mainly because I wanted to see family. My father, however, wouldn’t go back and it was a very sad thing because at one point his sisters and brothers were telling him that my grandfather didn’t have much longer to live. “You should come see your father before he passes” they said. But my father wouldn’t go and the next time he stepped foot in Palestine it was to attend his father’s funeral and I thought that that was just tragic. Not everyone has to do what I did; the important thing is to keep the memory and the attachment to Palestine alive and strong. People contribute in all different ways. As long as we continue to remember and do what we can for Palestine we will never loose. Even though my children are only 3 and 5 years old I have introduced them to Palestinian culture and even to politics! I started when they were babies telling them about Palestine and singing to them Palestinian nursery rhymes. Again, I really believe there is something we all have to do; we all have a role we have to play in the struggle and part of it is that, no matter where we are in the world, we pass down the connection and the attachment to Palestine and we don’t forget. Israel's first prime minister, David Ben Gurion said about us, "the old will die and the young will forget." Our old will die, yes, but it is incumbent upon us to make sure that our young never forget. What inspired you to set up the International Solidarity movement? I was only one of a few people, so I can only tell you my story. After I finished University I decided to move back to Palestine realising that I had opportunities because my parents were able to leave, I was able to have a good education, I was able to have freedoms my people mostly don’t have and therefore I wanted to see how I could contribute to my people’s struggle. I moved to Jerusalem at the time to work for a conflict resolution program that brought together Palestinian kids and Israeli kids for dialogue. We were still in the Oslo peace process period but when the second Intifada broke out shortly thereafter I resigned from this program. It’s not that I don’t believe we should talk to each other, I think people should always talk to each other as human beings, people to people. But I firmly believe these programs are detrimental to our cause because they project the wrong message. We used to bring Palestinian and Jewish kids together, they used to become best friends but then the Jewish kid would go back to their town or city likely built on the ruins of a Palestinian village and the Palestinian kid would go back to his or her town or refugee camp likely under the gun of an Israeli soldier which may very well be the sister or brother of the child they just became best friends with. The projection, the message that is given through these organisations is that it’s just about dialogue… talking to each other and learning to get along. But, that’s not it. Palestinians have no problem getting along with Jews or Israelis. It’s the systematic denial of Palestinian rights by Israel that is the problem. We have to address the politics that is tearing people apart and these programs generally don’t do that. Therefore the focus is wrong and participating in these programs becomes detrimental to our struggle because (1) it makes people feel good to participate and forget the politics, and (2) it projects the wrong message to the outside. It’s not just about learning to “get along;” we have to address the root causes of the problem which is violent settler colonialism and its manifestations. When the intifada broke out I was participating in the popular demonstrations; we were men, woman, children, old and young … everybody protesting against, not just Ariel Sharon’s provocative visit to the Haram Al-Sharif, but also over seven years of a failed Oslo peace process which promised peace and an independent state all the while giving cover to Israel to continue its colonisation—confiscating more Palestinian land, expanding settlements, demolishing Palestinian homes, etc. Finally, the Palestinians said, ‘enough, we don’t want to be a part of this façade of a peace process’ and the demonstrations continued. The violence used against us was lethal. Israel unleashed huge military force on our protesters causing massive causalities, which in turn caused more anger and more demonstrations. By the end of the first month of the second Intifada about 127 protesters had been shot dead and it was mainly from bullet wounds to the chest and head area, making it obvious that Israel had a shoot to kill policy. As a result of this massive violence unleashed on unarmed protesters, the fact that nobody was holding Israel accountable for killing and maiming Palestinian, the mainstream media blaming us for our own deaths, promoting the Israeli narrative that Yasser Arafat had turned his back on the peace process and that we—the Palestinians—had started the violence, not looking at Israel’s violence against us—both the systematic structural violence and the unleashed military force, together with the pain of decades of powerful yet unsuccessful resistance, the popular protests died down. Then those with guns in the Palestinian factions began using them in a way that didn’t make strategic sense, I mean we’re no military match for Israel. This gave Israel the excuse to fly their F16 and bomb our cities and roll in their tanks and there were even more causalities. This is where, I, still looking for a way to contribute to my people’s struggle, started talking to people to see what we could do about reviving the popular demonstrations because we certainly were not going to beat Israel militarily. This was a humbling time when I learned about the history of my own struggle and the very powerful resistance of our people through the decades and particularly during the first Intifada. You know, you study nonviolence and you see the Rev. Dr. Martin Luther King, Jr. or Gandhi, but you never see Palestinians in the history books even though, throughout the decades, Palestinians have used the very same tactics. Stand with Palestinian protesters side by side in the hope that the Israeli military won’t use lethal force against unarmed protesters. They have of course gone ahead and done so anyway but it is less when you have international eyes watching. We are also sending a message to the mainstream media: this isn’t Jew verse Muslim and Christian or Israeli verse Palestinian, this is freedom verse colonisation and oppression and therefore no matter your background, religion, or where you’re from in the world, you can come and stand with the Palestinian freedom struggle. You go back home you tell people. You campaign to change the policies of your own government that is blindly supporting Israel. You help break the isolation that Israel’s policies impose on the Palestinians, who see they are up against this massive force and military might that wants the land without the indigenous people, is committing atrocities towards that end, and the world isn’t doing anything about it. This creates a tremendous feeling of despair, but when you see people coming to say, ‘we see, we hear you, we stand with you,’ it’s a powerful message that helps the resilience and steadfastness of the people. That’s what the ISM does. It’s been almost 17 years since our first campaign in 2001, and well over 10,000 people have come from around the world and returned to their home countries to work on Boycott, Divestment, Sanctions and other campaigns to bring pressure from the outside and support the Palestinian struggle in that way. What advice would give to activist who feel they need to do something but don’t know where to start? The world is connected on social media now, we can see what others are doing all around the world, we can get ideas and inspiration and most importantly they can also see us in Palestine and know that people are raising their voices and they are not alone. Recently it was the campaigning of activist globally that helped Ahed Tamimi get a much lesser sentence then she would have otherwise gotten. It’s still atrocious what happened to her, but if people hadn’t raised their voices all around the world she would have gotten many more years. Ahed is now telling us to focus on the other Palestinian children in the Israeli military court system that have not gotten the global attention that she received but are, like her, sitting in an Israeli prison. Between 500 and 700 Palestinian children are put through the Israeli military court system every year and currently there are over 300 children languishing in Israeli prisons. Tell about the US government stance towards the Boycott Divestments and Sanction movement? About half of the states in the US now have some sort of legislation against boycotting Israel. They are fine with boycotting another US state—for example, North Carolina for its bathroom bill—but you can’t boycott Israel. It’s ridiculous. Most of these laws have been passed at the legislative level, but some were enacted through executive orders like, for example, in New York and Texas, it was the governor that signed an executive order against boycotting Israel. Each state’s law varies in terms of the sanction that it imposes on people who engage in BDS. There is one bill at the Federal level now that has many senators signed on to that makes it criminal to boycott Israel. It’s been through a change from its original form where one could be fined up to a million dollars and face up to 20 years in prison for engaging in protected speech. Now they removed the 20 years in prison and inserted some other language, but civil rights organisations maintain that it remains unconstitutional to pass these kinds of laws restricting people’s political speech. Our job now is to get such bills not to pass in the states where they have not yet passed. In the states in which they have passed, it’s not possible to take the issue to court until someone is actually affected by it. The effects have not been widespread, but it is beginning to happen. I will give one example. In Kansas, there was a teacher who generally gets state contracts to do some teaching and the latest contract that she was supposed to sign wanted her to declare that she is not engaged in any boycott of Israel and she will not engage in any kind of boycott pursuant to the law that was passed in Kansas. This teacher stated that her conscience would not allow her to make such a declaration. She not only believed in BDS on a personal level, but she is also an active member of the Mennonite church which has passed a divestment resolution. So, represented by the American Civil Liberties Union (ACLU), she took the matter to court. At the end of January of this year, 2018, a Federal Judge decaled that the law is unconstitutional and as a result there is now an injunction banning the enforcement of this law. It might be appealed but we won that first stage. I am confident that similar cases will result in similar outcomes. When it starts effecting people, we will take it to court because what these legislators, supposedly our representatives, are doing is putting Israel’s interest above the Constitution, and above the basic rights of the American people, the first of which is free speech. Even though there was just a handful of activist who campaign for Palestinian human rights in the room when they called out this bill, there was applause throughout the town hall. So you see, even average American citizens supported this stance that this senator should not be supporting this bill against BDS. This is significant because it is an indication of the growing divide between the views of the American people on what is happening in Palestine and the policies of the US government, which remains uncritically supportive of Israel. The US is behind the rest of the world; globally, the movement is growing. Globally history was made in May when the Spanish state of Navarre passed a bill to “support any initiative promoted by the international BDS campaign". Navarre is an autonomous province in Spain with an independent parliament, the first European parliament to adopt BDS as policy. A month before that, in April, the Dublin city council passed a resolution supporting BDS. While the policies of the US government towards Israel remain frustrating, it is useful to remember that the US was amongst the last countries to come on board the movement to disinvest from apartheid South Africa. But, in the end, it was inevitable, as I believe it will be here. Because, the goals of the BDS campaign and those of our liberation movement, are universal and they're just. Indeed, they are based on principles which the US, itself claims to stand for freedom, human rights, equality. The road ahead may still be long, but freedom is coming.